If you have ever had a water main break on your street or any other service disruption to your water supply you may have experienced a Boil Water Advisory or a Boil Water Order. 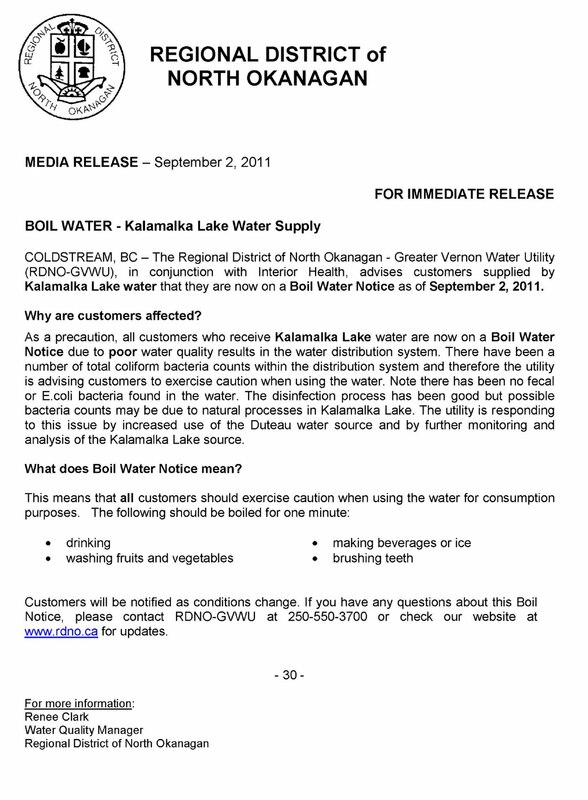 Boil water advisories/orders are the official response from the people running the water system. Below is a brief description of when a system would issue a boil water advisory or order and some general ideas for what should and should not be done as someone under a boil water advisory/order. The good news about a boil water advisory is that they are often issued as a precautionary measure. Meaning they are often used in cases where the water isn’t actually dangerous. The system operators issue the warnings so they have done the proper due diligence. The liabilities involved if someone gets sick or dies and the public wasn’t informed are huge. Ok, at this point you may be wondering what sort of situations would require a boil water advisory. Typically any time there will be work on the distribution system requiring lowering the pressure or if the disinfection of the water system is interrupted for a long time. Boil water orders are more serious. They come into place when large and persistent problems occur. Things like contamination of the source water and major failure of critical treatment equipment can cause boil water orders. The biggest thing you should not do is abandon drinking tap water in favor of bottled water. This is a mistake. If you do this you are still at risk but you are significantly less likely to hear about it if something is wrong. Another thing to avoid doing is panic. This is one of those things where no news is good news. I tell the people that if you stop seeing me and hearing from me then everything is back to normal. This is because I am legislated to tell the public when there is a problem. At this time I also tell them the time line as does the written notice. After two consecutive clean water tests the system and water return to normal. It is also way too time and cost prohibitive to go back door to door and say “everything is fine now”. If you live in a large city, there will probably be some media coverage of the return to normal situation. Otherwise if you don’t hear anything. After the date on the notice your water is fine. If there is still a problem they are legally required to tell you again about the problem. 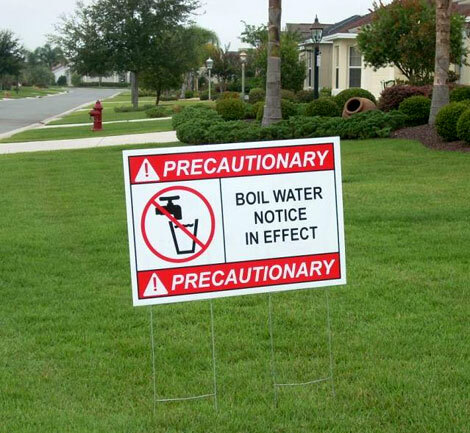 Neither a boil water advisory or boil water order is something to panic about it is not time to call a well driller and go off the water system completely (if that is even an option where you live). It is time to start using your preparations and your backup water supplies. If you don’t want to or can’t boil your water then you can always use an alternative form of disinfection. Either ultraviolet radiation, sodium hypochlorite or calcium hypochlorite are acceptable alternatives. Be careful of using these alternatives for highly turbid water sources. The floating debris in the water can hide pathogens, cryptosporidum is highly resistant to chlorine as is girarda adding enough chlorine to kill these two microorganisims will make the water unsafe to drink. Turbidity can also react with the chlorine to form hazardous chemical byproducts. Remember turbidity is removed from the water by setteling and filtering before disinfection to avoid these two problems. You may want to install a water filter in your home or purchase a portable water filter as a backup. All that is left is what needs to be done after the boil water notice or order is lifted and everything returns to normal. Flush all water-using fixtures like faucets and showers for at least one minute. Drain and flush all ice-making machines in your refrigerator. Run water softeners through a regeneration cycle. Drain and refill hot water tanks set below 45 C (normal setting is 60 C). Change any filters either under sink style, on the faucet style and the ones in a jug in the refrigerator, regardless of the type of filter. Filters that are designed for untreated water will not need to be changed unless they are used up. Ultraviolet light is a very popular method of disinfecting water. UV radiation is part of the electromagnetic spectrum that has incredible properties for the killing of microscopic organisms. While there are varying degrees UV resistance within microscopic organisms, not one has yet been able to develop a total resistance. 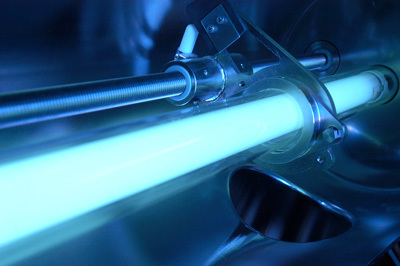 Because UV disinfection systems are not chemical or biological they have an extremely long shelf life. There is a wide variety of ultraviolet disinfection systems that range from the size of a pen to large banks of meter long light bulbs and many options in between. UV systems tend to be very simple to install and operate and UV leaves nothing behind and there are no disinfection by-products from its application. In fact ultraviolet radiation can break down some potentially harmful chemicals like chlorine and chloramine compounds. The limitations of UV disinfection are; distance, time, turbidity and electricity. Proximity is critical for UV disinfection, the water needs to be very close to the UV light source. The farther away the water is the more radiation is absorbed by the water. Meaning that with increasing distance you get weakening disinfection. Proximity becomes even more critical in hard water. Hard water sources leave a white chalky residue of calcium carbonate which covers the UV light bulb, making the radiation emitted significantly weaker. Time is another significant limitation of UV disinfection. The amount of time pathogens spend in the UV greatly affects whether or not the pathogen is neutralised. This is similar to how people get worse sunburns the longer they are exposed to the sun. Time is directly related to the flow of the water, if the flow is too much, the water will not spend enough time exposed to the radiation and will not be disinfected. Slow moving water or even static water is best. The efficiency of UV disinfection is greatly reduced by turbidity. Turbidity physically shields the organisms from the UV light. Exactly the way a beach umbrella shades people from the sun. This is called line of sight disinfection. There is no disinfection in the shadows when using UV radiation. Electricity is another limitation of UV disinfection systems. They are limited in two ways by electricity. First by the fact that they are quite literally light bulbs placed underwater and secondly by fluctuations in the electrical source cause fluctuations in the UV radiation field emitted from the bulbs. Both these problems are easily overcome. By sealing the system in clear waterproof chambers can effectively keep the system safe from the water. Fluctuations in the electrical source can be minimized through proper system design and using fresh/charged batteries in battery powered systems. Portability is a mixed blessing with UV disinfection systems. Smaller, pen-like devices are easy to transport, but are significantly less powerful. That means they need to be used on slower moving/still water and used for longer than larger UV systems. Another mixed blessing of ultraviolet disifection is the fact that there is no disinfection residual left in the water. Not having a disinfection residual is great if you are drinking the water immediately, otherwise recontamination can occur very quickly after the UV lamps are shut off. UV is not enough if you plan on storing the water for a long period of time. Recirculating the water to be disinfected a second or third time will greatly increase the chances of proper disinfection. Remember that disinfection whether by UV or chlorine or any other method is one of the final stages of water treatment. Forgetting to filter the water first will make disinfection significantly more difficult. Regardless of the size of the of the system used, ultraviolet radiation can be used to supplement any water treatment process. Non-Chlorine Pool Chemicals: Safe for Drinking Water? When an emergency or a disaster strikes and you run out of clean drinking water, a clock starts counting down. Three days is all that this clock has. Three days is how long it takes a healthy adult to die of dehydration. This journal entry is a continuation of my article on Pool Chlorine and Drinking Water. Many people with pools believe they can use this water as a back up source of drinking water, whether or not that belief is a sound one is not always a simple answer. While chlorine is by far the dominant disinfection agent used in pools there is a growing trend away from using chlorine. In the first article (linked to above) I covered all the common types of pool chlorine chemicals. 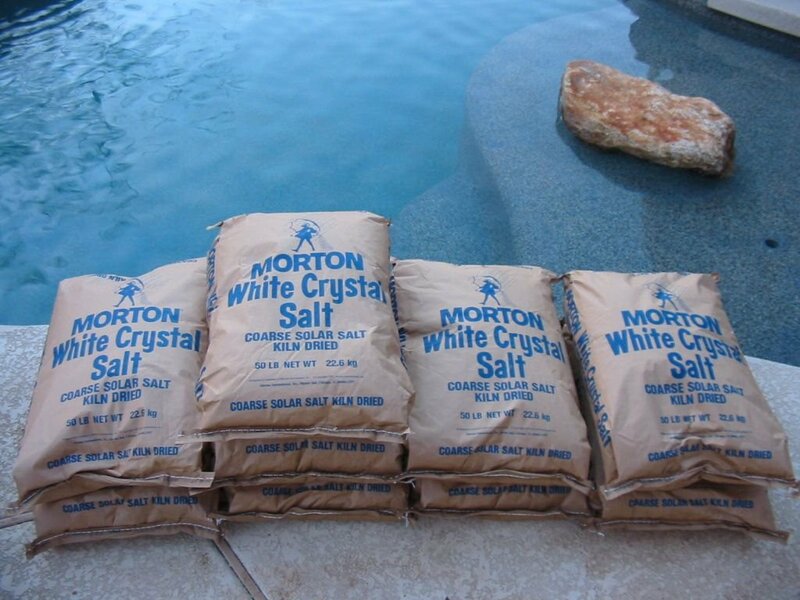 In this article I will discus some of the other chemicals used in pools, and how they affect drinking water in survival situations. I always recommend drinking the safest quality water you can get, clean untainted water that has been properly disinfected is always at the top of the list. The advice that follows is for those situations where pool water and pool chemicals are better than tainted and untreated water. That decision is something that everyone has to make for themselves when the emergency hits. There is a lot of misinformation available about water quality. If taken as true in the wrong situation they could be very costly, they might even cost you your life. The first myth I want to mention is the belief that ground water is pure. See my article on why I dislike the term “purify” when it concerns water. I have heard this over and over again, “if we were all drinking ground water we wouldn’t need all these chemicals and we would all be healthier”. This simply isn’t true. Ground water does contain bacteria, it is usually free from pathogenic organisms, but that is not guaranteed, and if your system isn’t used to the specific bacteria in the ground water they may still make you a little sick. A passive solar heater is a simple thing you can make to help heat your home. It obviously will not work at night, but it can reduce heating costs during the day. This solar heater is very simple and can be made with items already in your house. This heater works in a similar way to a solar oven, but is simpler and doesn’t get as hot. All you have to do is place the heater in a window that gets sunlight. The black paint warms the trapped air in the bin till it leaves through the top hole, drawing in colder air through the bottom holes in a chimney effect. This type of heater is perfect for a greenhouse or to supplement heat in a colder room in your house. They can add a significant amount of heat if you use multiple heaters. Clear rubbermaid bin (Different sizes will produce different amounts of heat). Paint brush (or spray paint in item 2). Clear plastic wrap (clearer the better and thicker is better too). Cutting tool for plastic (doorknob drill bit 2″ in diameter works best). Purifying Water What Does It Mean Exactly? 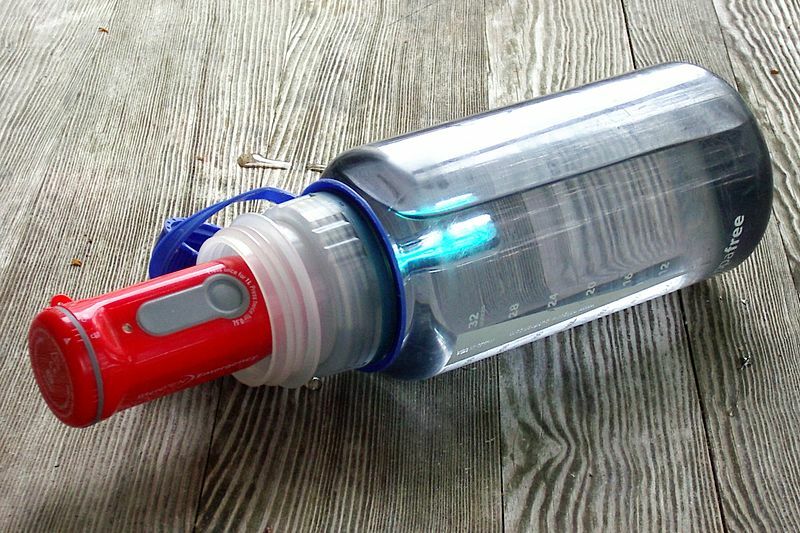 I read a lot of survival and preparedness articles that refer to purifying water. I just want to clarify some of the terminology surrounding the treatment of water. First off I dislike the term purifying, it is a marketing word that hopes to make you think the water is now pure. No product or process can remove 100% of the contaminants from the water every single time. That is why you see 99% to 99.99999% attached to them.